We believe that by learning about different aspects of local, British and world history, pupils will acquire a wide range of historical skills and develop a sense of identity and a cultural understanding based on their historical heritage. We aim that they should appreciate that history is concerned with change and that people in the past have changed the societies in which they lived. Pupils should understand the nature of evidence and be able to distinguish between historical facts and their interpretation. 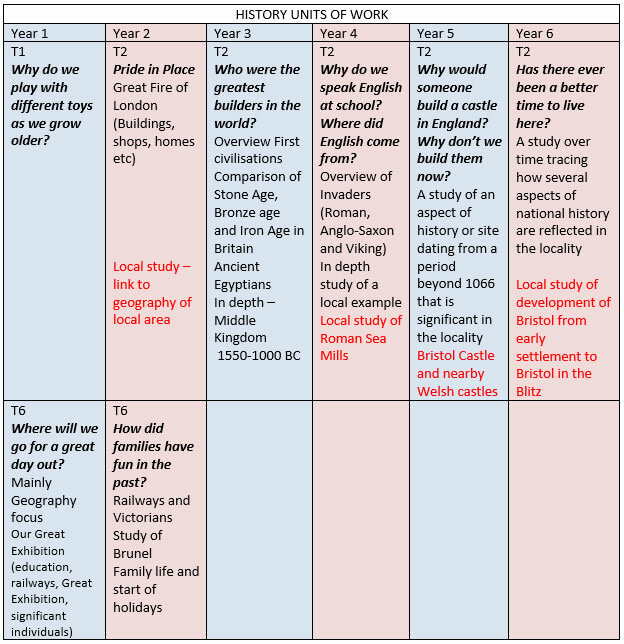 History is taught throughout our school as part of a series of enquiry units, over a two-year cycle. Each year group studies an enquiry with a main history focus at least once a year and relevant historical links are made to other units throughout the year. All units start with a question that will be answered through the study and a ‘wow day’- an experience that is designed to stimulate interest and curiosity. We encourage an appreciation of chronology and the use of appropriate historical terminology. Pupils are able to handle artefacts and to distinguish between primary and secondary sources of evidence. Children learn that evidence can be interpreted in different ways and that they should be critical thinkers when researching and presenting information about the past. We ensure that children have a clear sense of local history and learn how the community of Sea Mills developed from Roman origins to the post-war suburb of a historic city. We provide opportunities for cross-curricular links to be made, especially through studying the art and music related to the periods of study. Our history curriculum is further enriched through regular opportunities for all of our pupils to visit museums and historic sites and to take part in workshops led by visitors to our school. Your child will be asked to carry out research during enquiry units using the local library and the internet. Please help them to find relevant information. They might need to interview relatives; for example, Years 1 and 2 might ask about toys played with when grandparents were younger, in order to understand how technology has changed children’s entertainments.